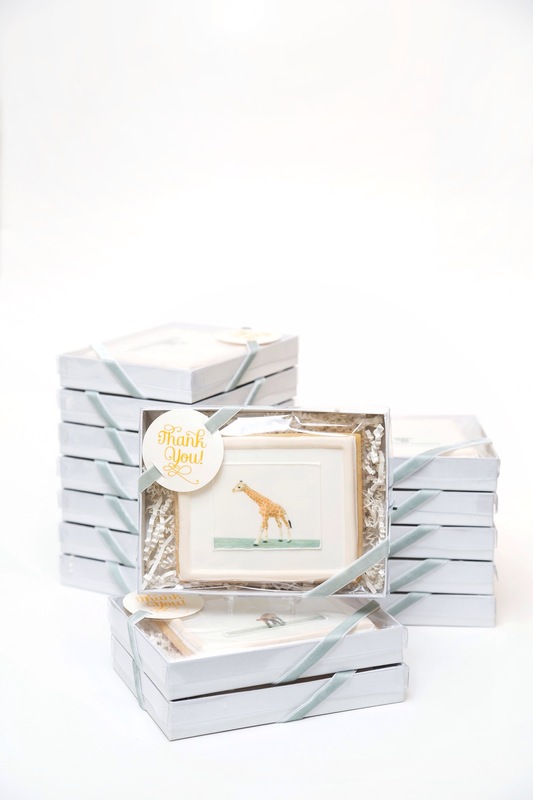 For a detailed backstory on the theme for these Baby Zoo Baby Shower Cookies Favors and for lots of baby shower eye candy, refer to my previous blog post here. These are the "studio" photos of the cookie favors. Each cookie is decorated like a framed nursery art print. The cookies are wrapped in cello bags, placed on ivory crinkle shred paper in a stationary favor box, wrapped in velvet ribbon. I attached a little "thank you" tag to the ribbon as the final touch. The photos are printed edible images of baby zoo animals -- actual photos were taken by my husband of Schleich toy animal and the style of the photo is entirely inspired by Sharon Montrose's Animal Print Shop.